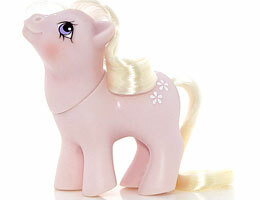 My Little Pony were originally produced by Hasbro for twelve years from 1982 to 1994 (Generation 1, or G1), with the last two years only being sold in UK/Europe, making them very collectable to US buyers. 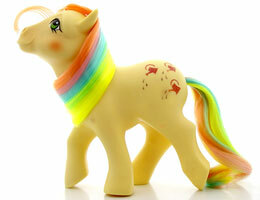 There were literally hundreds (if not thousands!) 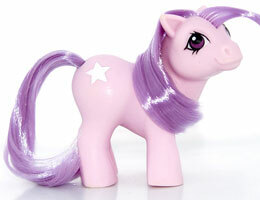 of ponies produced, as well as ample playsets and other pony accessories. 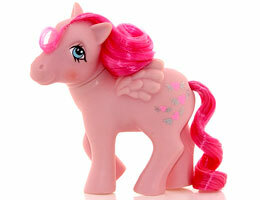 MLP Year 3 had eight new sets of ponies (plus two new UK sets) and one new set of plush ponies. 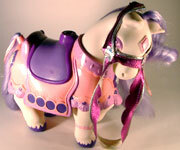 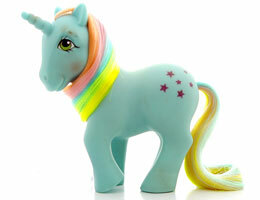 There was one set of special offer ponies, four new playsets, plus new accessories and pony wear. 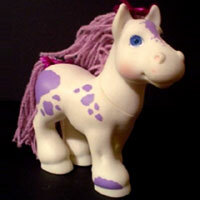 Images on this page thanks to Silver Tickle, Ponyology and various eBay sellers! 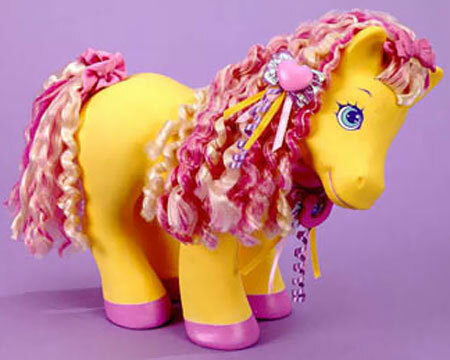 Year 3 had a second set of Earth Ponies (with curly hair), which were called Groom and Style Ponies in the UK (and Bow Tie and Applejack had a different pose). 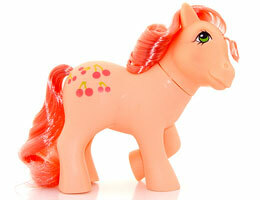 Cherries Jubilee and Posey (both with darker symbols) were released in another Y3 UK set simply called My Little Pony along with four new mixed ponies (see lower down for the two earth ponies). 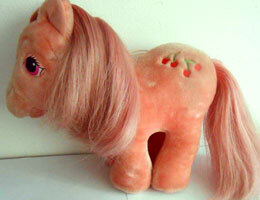 Cherries Jubilee, Lickety-Split and Posey were also sold in the So Soft line in Year 4 with flocking. 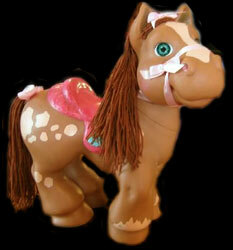 It seems that only Tootsie was not sold elsewhere! 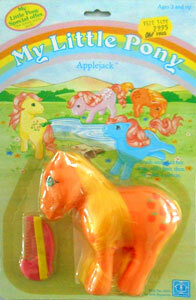 Each pony came with a butterfly shaped brush, a ribbon and a round, scented puffy sticker (except UK Applejack,Bow Tie and Posey who came with moon and stars shaped combs instead). 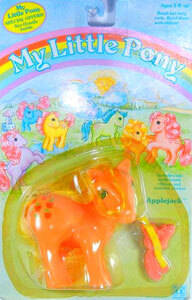 Packaging is dated 1985 and had a different story for each pony on the back. 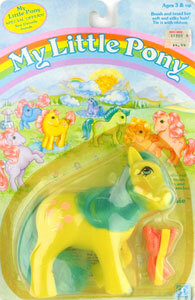 The illustrated ponies on the front of the packaging was very similar to the previous years set. 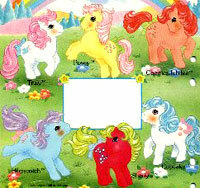 Packaging back also included the Unicorns & Pegasi and had a different story for each pony. 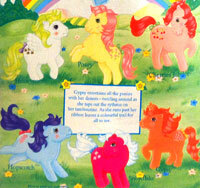 Packaging is dated 1985 and had a different story for each pony on the back. 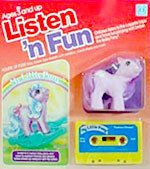 These packaging illustration were used elsewhere in Europe also. 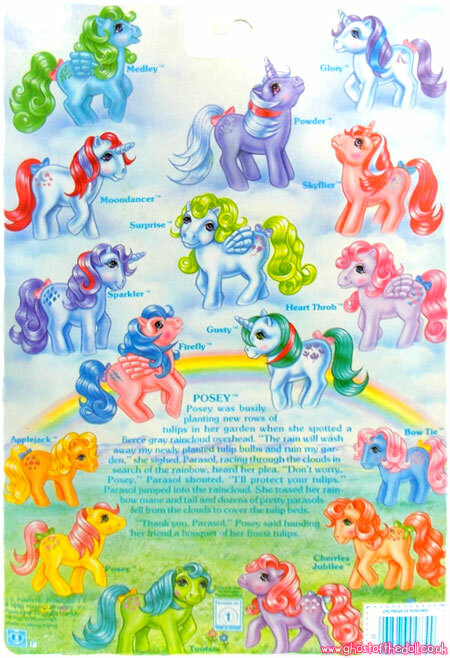 My LIttle Pony was a mixed type UK set which included two ponies from this year's Earth Ponies set (Posey and Cherries Jubilee) plus two new earth ponies, one new unicorn and one new pegasus. 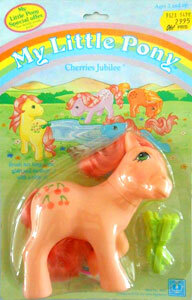 Posey and Cherries Jubilee were exactly the same as shown above. 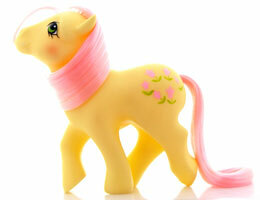 Each pony came with a bird shaped brush, a ribbon and round scented puffy sticker with their picture on it. 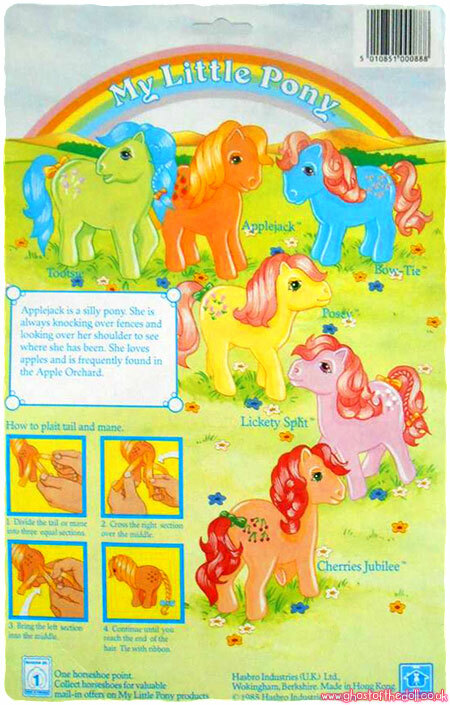 During Year 4 in Scandinavia/South Africa, a set called "Ponies" was released which included Cherries Jubilee, Hopscotch and Posey. 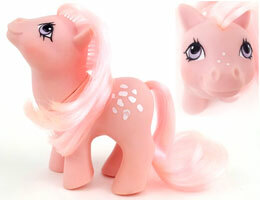 Also part of the set were Shady, Cupcake and Truly from the So Soft line (but unflocked). 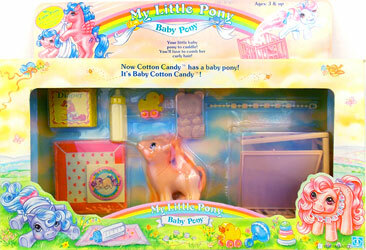 UK back packaging on the left and the later Scandinavian packaging on the right show Honeycomb changed to Truly, Snowflake changed to Shady, and Gypsy changed to Cupcake. 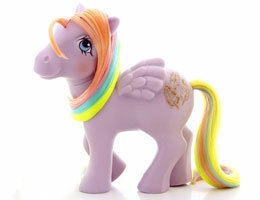 Rainbow Ponies returned for a second time with three re-issues (Moonstone, Starshine, Parasol and Windy - no change) and six new ponies and a new hair colour combination. 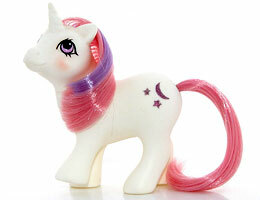 All ponies had glittery symbols, except those produced in Italy which had painted versions. 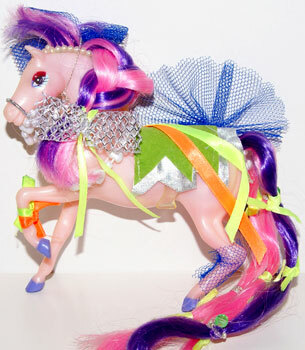 This set was not sold in the UK with the exception of Confetti who was sold separately as "Wedding Bells, Confetti Pony" and in a different pose (see lower down for more info). 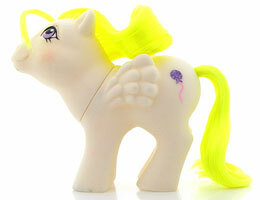 Each pony came with a round, scented puffy sticker with their picture on it, a ribbon, a comb and a shooting star shaped brush with a rainbow sticker on the back. 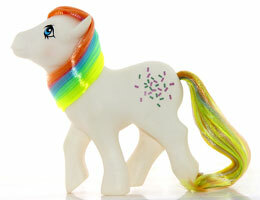 UK "Wedding Bells, Confetti "
Although the Rainbow Ponies were not sold in the UK, Confetti was. 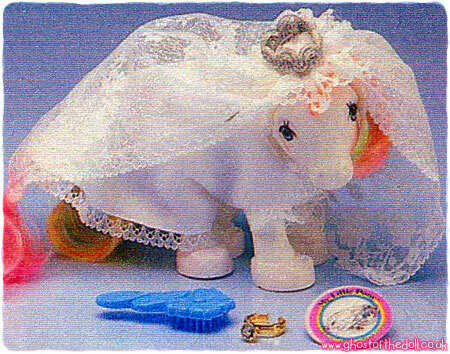 She was marketed as "Wedding Bells, Confetti Pony" and sold separately. 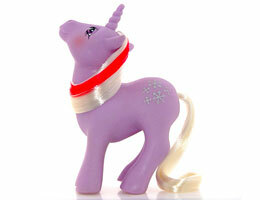 Unfortunately poor old Confetti never did get a groom! 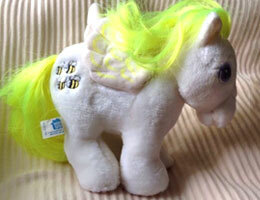 Year 3 had six new Unicorns and Pegasi, along with the re-release of Firefly, Medley, Moondancer, and Glory from Year 2 (now with curly hair). 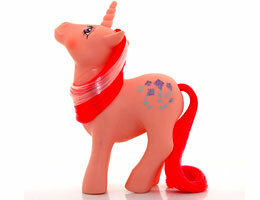 Their symbols were still made from glitter. 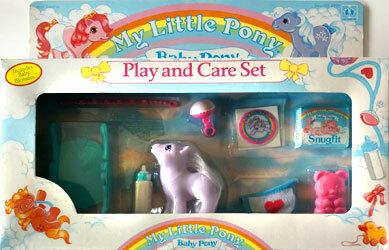 As with Year 2's set, this set was not released in the UK. 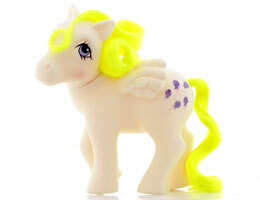 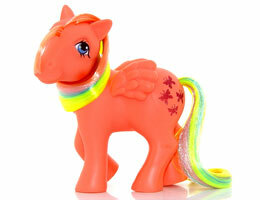 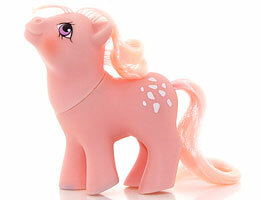 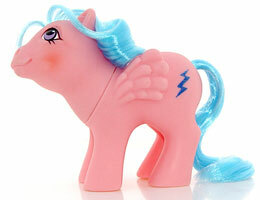 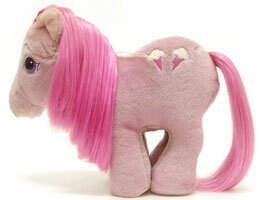 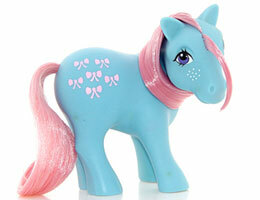 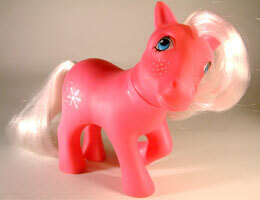 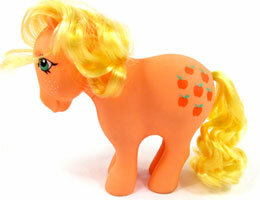 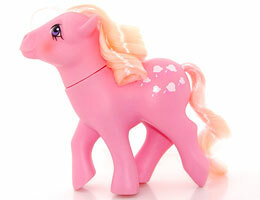 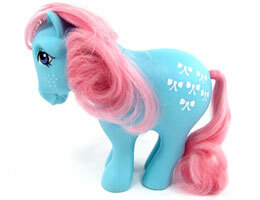 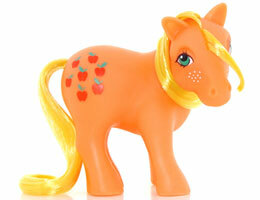 Gusty, Heart Throb and Surprise returned as So Soft Ponies in Year 4 (and as UK/Euro non flocked versions). 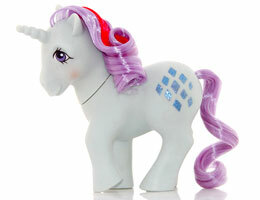 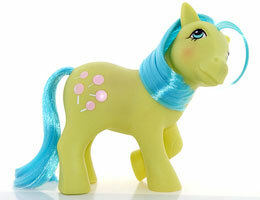 Each pony came with a brush or comb, ribbon, and round scented puffy sticker. 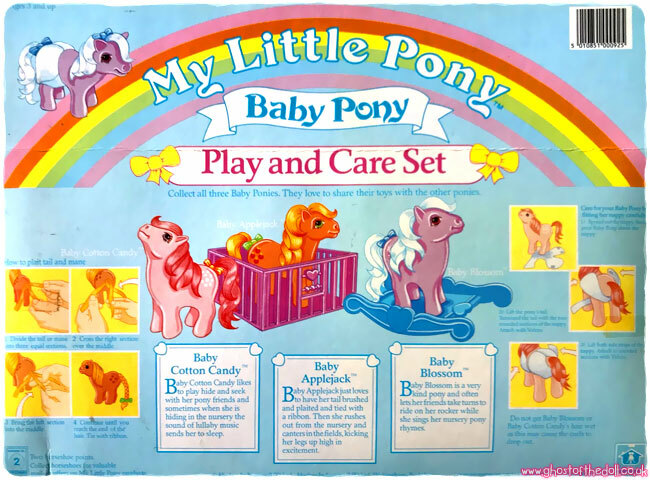 "They love to share their toys with the other baby ponies!" 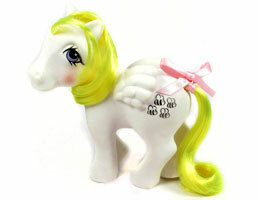 Year 3 saw the introduction of Baby Ponies, which were released in various guises throughout all US and UK production years. 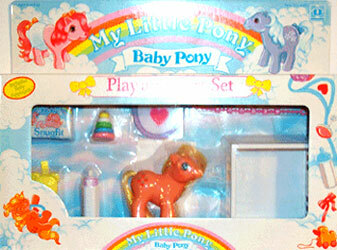 The US set comprised of six ponies, where as the UK set (called Baby Pony Play and Care, shown lower) comprised of only three (including a UK exclusive pony). 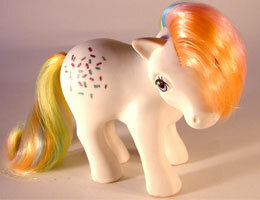 Baby Cotton Candy was also released as part of a German Baby Ponies set in Year 4, along with five new exclusive babies. 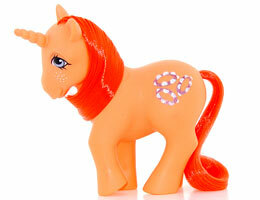 All pegasus and unicorns had glittery symbols, but in parts of Europe they were released with non-glittery symbols. 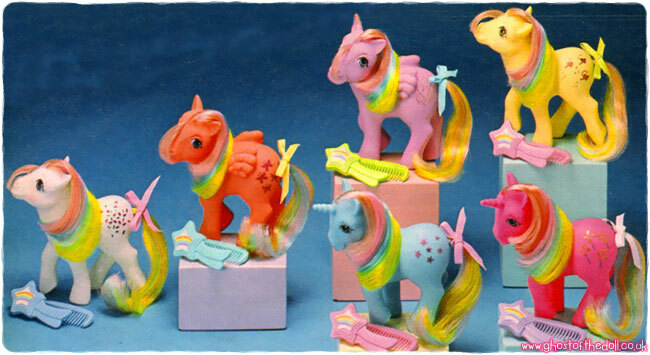 All ponies from this set were re-issued as Baby Pearlized Ponies in Year 7. 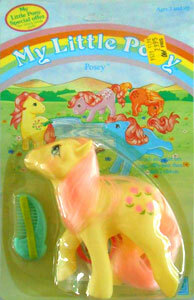 Each pony came with several accessories, plus a teddy bear brush, a ribbon and round scented puffy sticker with their picture on it. 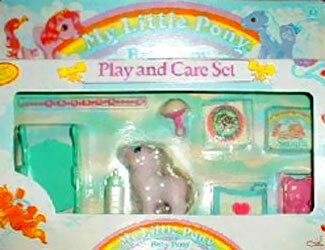 Baby Pony Play & Care set was the UK's version of the US's Baby Ponies and included Baby Applejack, which was an exclusive UK release, never being sold in the US. 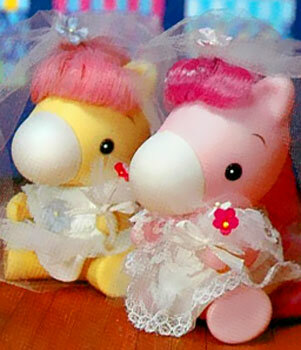 The UK set also included Baby Cotton Candy (with nose freckles) and Baby Blossom, but were no different from the US release above. 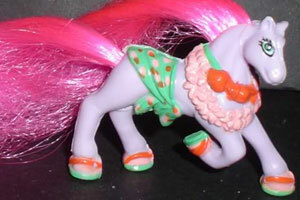 Each pony came with various accessories as they did in the US. 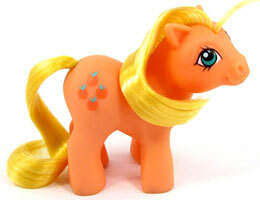 This is the fourth version of Ember to be made. 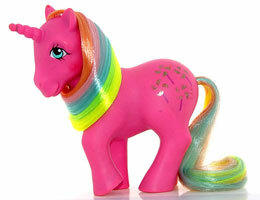 The previous three were released in Year 2 in a special offer and came in three different colours but no symbol. 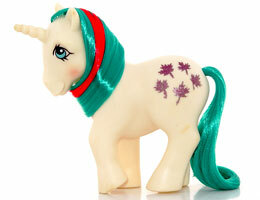 This version of Ember was a different colour combination again and this time she had a symbol. 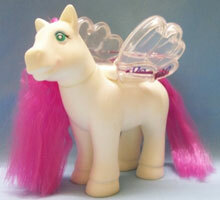 She came with a story cassette tape entitled "Ember's Dream". 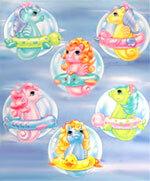 Six new Sea Ponies were introduced in Year 3. 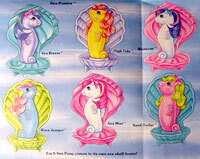 Three of them came with new swirl design shell, while the other three came with the original design. 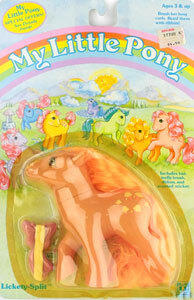 All shells could stick to the side of the bath via a sucker, and the ponies could float in water. 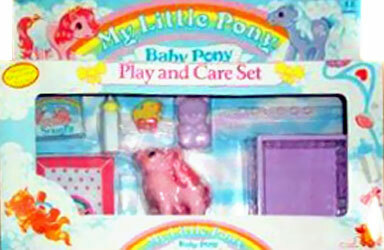 This set was not released in the UK. 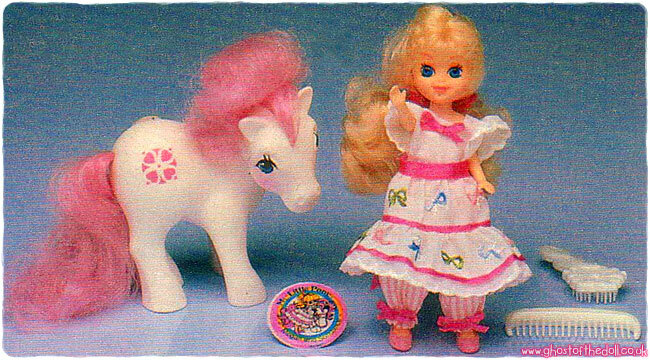 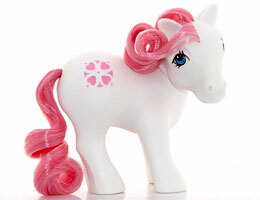 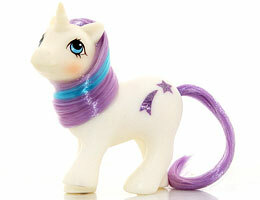 Each pony came with a shell, shell brush & comb, hair ribbon and round scented puffy sticker. 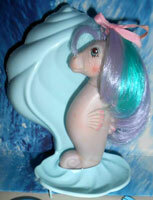 Unlike adult Sea Ponies, Baby Sea Ponies needed help to keep them afloat in the water. 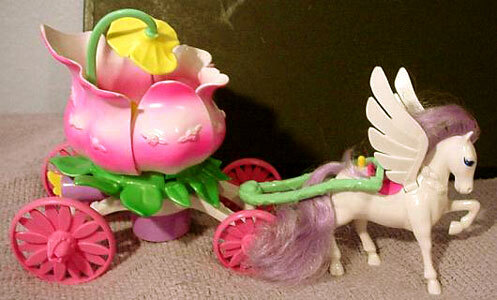 The floats came in three variations (duck, fish & turtle), each in a different colour. 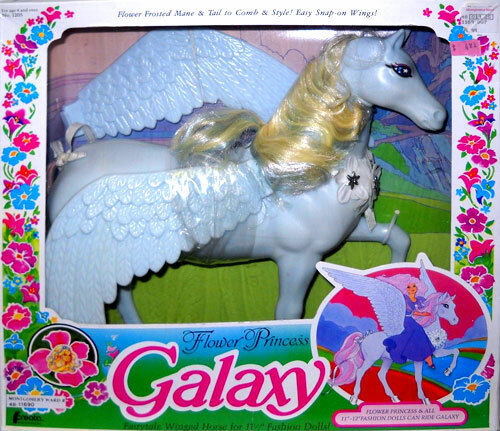 They had no symbols. 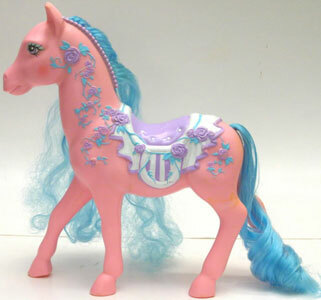 Sea Shimmer and Surf Rider returned in Year 4 as Pretty 'n Pearly Baby Sea Ponies in the US, while Sea Star and Tiny Bubbles were included in the UK's Pretty & Pearly Baby Sea Ponies. 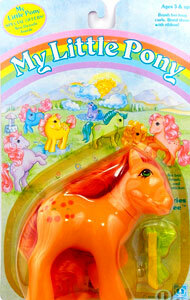 Each Baby Sea Pony came with a different coloured whale shaped brush, and a round, scented puffy sticker. 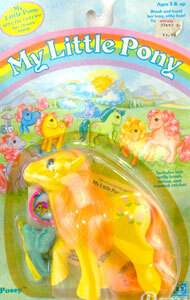 Megan & Sundance were always sold together and returned several times in different styles. 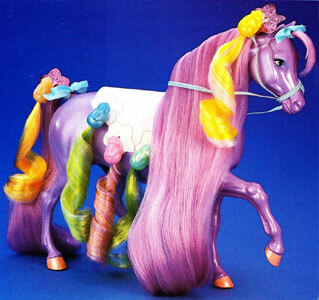 In Year 4 Sundance was a So Soft Pony and in Year 7 a Twice As Fancy Pony. 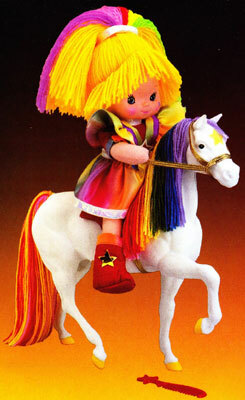 Megan & Sundance were also available with a playset called Megan's Place, only available in the 1985 US Sears catalogue. 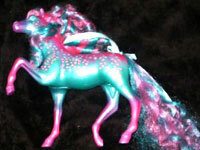 In the US Sundance came with bridle and reins but in the UK she did not. 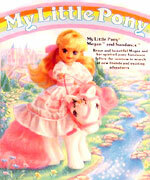 Megan also came with a different set of clothes in the UK to the US release (see publicity shot). 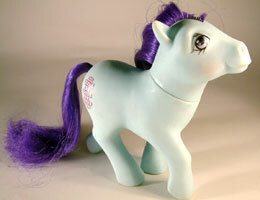 The set came with a blue flower shaped brush comb (possibly white in the UK), and a round, scented puffy sticker. 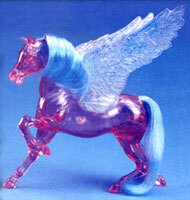 This publicity shot from the UK Argos 1986 catalogue shows Megan's dress. 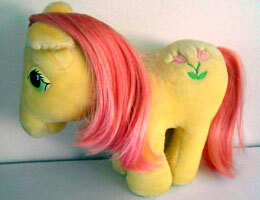 There were four new Plush Ponies produced, three characters from this years plastic Earth Ponies set and one UK/Euro exclusive from the UK/Euro My Little Pony set.